3. A natural aversion to alcohol and other calorie-laden treats. Oh well. It’s good about the spots, at least. In the past I have had the odd few every year, which I have self-diagnosed (with all of my medical knowledge) and treated with such things as toothpaste, witch-hazel and vodka (don’t ask). Perhaps it was the traveling, the Roman air, the early starts; I’m not positive on the cause, all I know is that spots started popping out all over the shop. I had one classic one on my chin in a place where I am pretty sure a spot has never been before. Imagine! A piece of smooth, virgin skin. Violated. 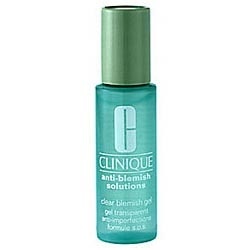 I decided that for once I would use a proper remedy, something that was actually designed for getting rid of blemishes, and I plumped for Clinique’s anti-blemish solutions clear gel. I have to share my fears: I thought that to be effective it would have to be harsh, drying, that it would sting and burn and leave a load of dead skin hanging off the top of the spot. Boy was I wrong! I applied it before bed and awoke the next day to find instant results! I would say that each blemish was about half the size that it was the day before. There were no dry patches on or around the blemish and the formula had not irritated my skin at all! I applied it again underneath my concealer and it was totally transparent – the concealer seemed to actually perform better over the blemish gel than it would have done normally… A few days on and the spots are mere shadows on my skin. UPDATE: In the interest of fair testing (as I am not really ‘au fait’ with spot treatments) I tried out a cheap treatment. Clean and Clear’s Advantage Quick Clear Gel. Yes, it was only £2.80, but…OUCH! That amount of burn can’t be good.